Calls to abolish the U.S. Immigration and Customs Enforcement agency, also known as ICE, are getting louder. But at the heart of much of the furore is a belief that this is the government agency that is separating families at the US-Mexico border. A different U.S.agency—Customs and Border Protection, which oversees the Border Patrol—is responsible for policing the country’s borders. And it is agents patrolling the US-Mexico border who have been enforcing the Trump administration’s “zero tolerance” policy, by arresting adults who illegally enter the US, and separating them from their children. So if it isn’t ICE that is separating families at the border, what do they actually do? And why are there calls to abolish the agency? Here’s an explainer. When was ICE set up? ICE was created in 2003, following a massive government reshuffle that came in the wake of the 9/11 terror attacks. The new government agency was granted unique civil and criminal powers to defend the U.S.border and the American people. It is one of three agencies—all part of the Department of Homeland Security (DHS)—that’s been tasked with immigration control. The other two are Customs and Border Protection and Immigration and Citizenship Services. ICE now has more than 20,000 employees and has a presence in all 50 states. ICE has three primary functions: immigration enforcement, investigating the illegal movement of people and goods, and preventing terrorism. 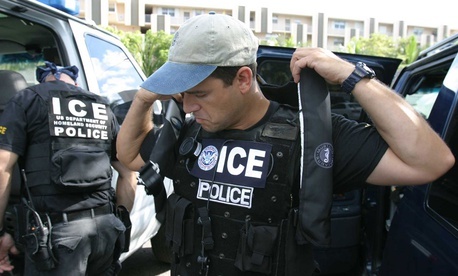 The agency largely focuses on immigration enforcement and works predominately within the US. This means apprehending and deporting immigrants who don’t have the right to live there. In recent months, ICE carried out a number of high-profile raids. In June, it arrested nearly 150 meat plant workers in Ohio. In April, the agency raided another plant in eastern Tennessee, arresting nearly 100 people. As a result of that raid, more than 500 kids missed school the next day. Critics warn these raids could lead to long-term trauma within these communities. Under the Obama administration, the agency was tasked with mostly focusing on deporting immigrants with a criminal record. However, deportations soared under Obama. In fact, under every quantitative measure— arrests, deportations, and the share of all deportees with no criminal records—immigration enforcement was far more aggressive under Obama’s first term than Trump’s. Since Trump has taken office, however, the DHS has been given more scope (paywall) to find, arrest and deport all those in the country illegally. Why do people want to abolish the agency? ICE may not be be to blame for separating families at U.S.borders, but the agency has long been dogged with claims of abuse. In April, the Intercept obtained 1,224 complaints of sexual and physical abuse in immigration detention centers. Filed between 2010 and September 2017, half of those accused in the complaints worked for ICE. Other reports detail systematic failures that have resulted in suffering and preventable deaths in detention centers. And more recently, ICE allegedly detained 92 immigrants on a plane for nearly two days in what advocates called “slave ship” conditions. Elected Democrats and left-wing activists have called for ICE to be reformed or abolished, including Senate minority leader Chuck Schumer and House Democratic leader Nancy Pelosi. Congressman Mark Pocan says he plans to introduce legislation to abolish the agency. But calls haven’t been limited to the organized left. Even ICE agents have called for it to be disbanded. In January, more than a dozen ICE agents signed an open letter that claimed the immigration crackdown made it more difficult to conduct effective investigations into significant national security issues. Does abolishing ICE mean open borders?